Because there are numerous variables required for your reservation – (length & type of rig, desired hookups/services, discounts, length of stay, etc.) it’s best to call (575-472-3126) and we’ll reserve exactly what you need. 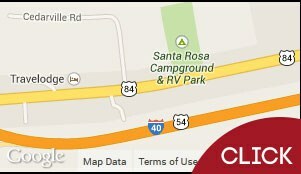 Santa Rosa Campground is located in Santa Rosa, New Mexico on historic Route 66. EZ access to and from I-40 exits 275 and 277. We have RV sites, tent camping sites, and a cabin. Also, an onsite pool, restaurant and free WiFi. Santa Rosa RV Park in New Mexico offers up to 90′ pullthrus with up to 50 amp electrical service.